Deirdre Burns White clings desperately to her normal life. She has a job, a boyfriend and an apartment in the city of First Landing. She's made sure life is normal... because Dee is an extrahuman. She can make fire with her mind and she has the devil's luck, but because of that, she was once imprisoned and tortured by the ruthless Confederation military. All she wants is to bury the past and blend in. When an old friend shows up bearing a letter and a command, though, Dee finds she can't run any longer. The ghosts of her past have come back to haunt her, even as the first cracks finally begin to show in the Confederation's smothering oppression. Now First Landing is in a state of open, wild revolt, and Dee has to make a choice: to hide herself away, lost to guilt and regret, or to embrace her past and her dangerous powers to help save the people and the city she loves. Dee could set the world on fire; all she needs is a spark. This was my favorite book from the Extrahumans series. It was very character-driven, with most of the focus on Deirdre (who goes by Dee). Dee is an extrahuman, possibly the most powerful extrahuman alive. Many extrahumans have been killed by the Confederation, due to their threat to the crushing control the Confederation exerts on humanity. Dee can create fire with a thought and also has an intuition that provides her with extraordinary luck and protection in dangerous situations. Dee has gone through a lot in her life, and is trying to suppress her extrahuman abilities and live as a 'normal' human. She's just trying to blend in, but because of her true nature, and her past, she can't open up to let anyone into her life. She has an on-again, off-again boyfriend, whom she's never shared her secrets with. Dee can never be her true self with anyone. She has to constantly control her emotions, so that she doesn't accidentally set something---or someone---on fire. One day, Dee runs into an old friend from her past, who brings her a letter with instructions for Dee, instructions to complete a very big and important task. Dee doesn't want any part of the extrahuman life anymore. She is just trying to be normal and live under the radar, under the notice of the Confederation. But, there's too much going on in the world (including the other planets in Bigelow's futuristic world) for Dee to sit idly by and watch while others are hurt. Dee's decision to help leads to the action-packed part of the book, which was great. What I really liked about The Spark was that it was full of character growth. Dee really goes on a journey, both physical and emotional, with the path ending in self-acceptance and the ability to open herself up to love. All of my favorite characters from the first two books came back in The Spark, with the exception of Sky Ranger. The omission of Sky Ranger leads me to wonder if this book is in fact the end of the Extrahumans series. I really hope it's not, and that we'll get a fourth book, to see how things end with Sky Ranger, as well as Ian. I want to know if the prophecies come to pass! 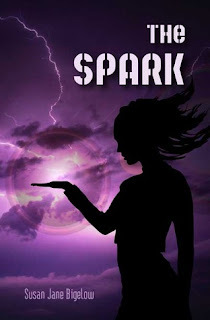 There was a lot of action in The Spark, more than I was expecting, but I enjoyed it. The only thing that slowed me down was keeping the political parties straight. Sometimes I started to get confused. It made me wish I had read all three books closer together, instead of just books two and three back-to-back. Overall, I really enjoyed The Spark and would highly recommend Susan Bigelow's Extrahumans series. It's a really unique, well-executed series and I will definitely be reading Bigelow's future work!